We use model organisms for everything from studying metabolism to producing therapeutics. 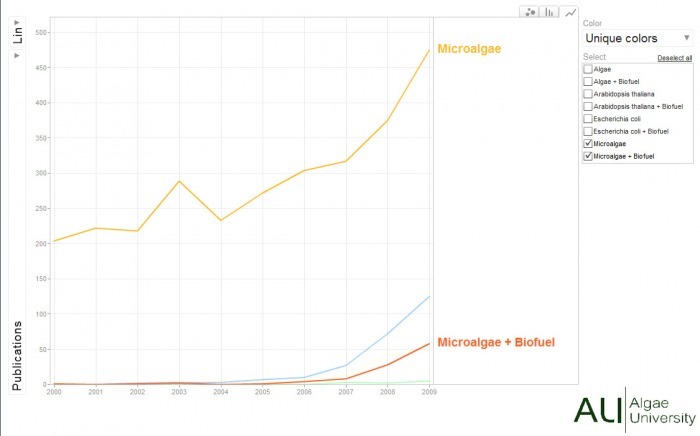 There has been an interesting trend in the area of of research models for biofuels. 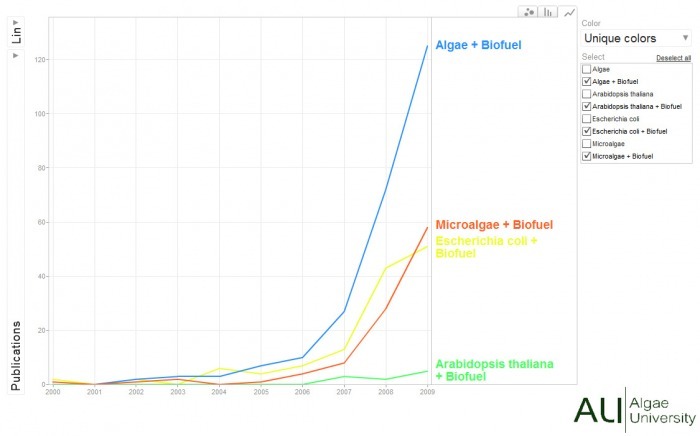 Algae and microalgae for fuel have become incredibly hot research topics especially in biofuels. 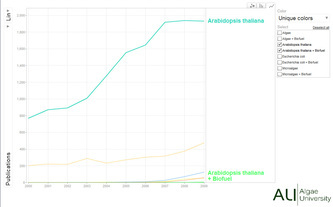 Using the database Scopus I searched it using the terms “algae”, “microalgae”, “Arabidopsis thaliana”, and “Escherichia coli” to find the number of publications done each year. 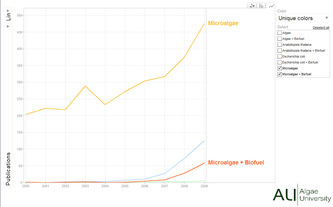 When you look at the number of papers published per year for each term, and each term in relation to biofuel papers you see some interesting results. 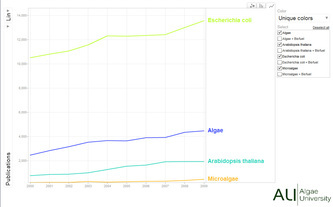 Algae, and microalgae publications are exploding! 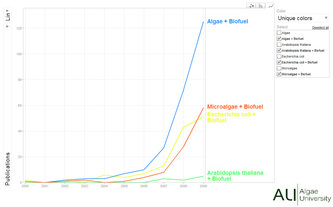 There are more publications related to algae for biofuels than there are for any of the other model systems. 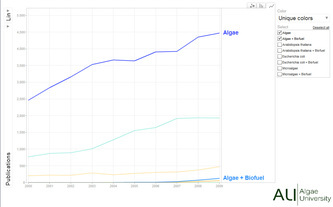 Now, I admit that the comparisons are not exactly fare since it is bundling all algae research together to compare it to specific model systems. 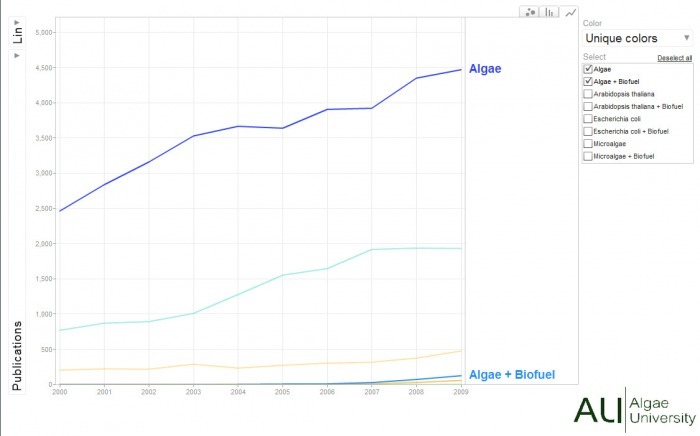 However, it is likely that with the broad scope of algae that are being studied, a few model systems of algae will emerge for studying biofuels. One potential model system would be Botryococcus braunii which is a well known high oil producer of long chain hydrocarbons. 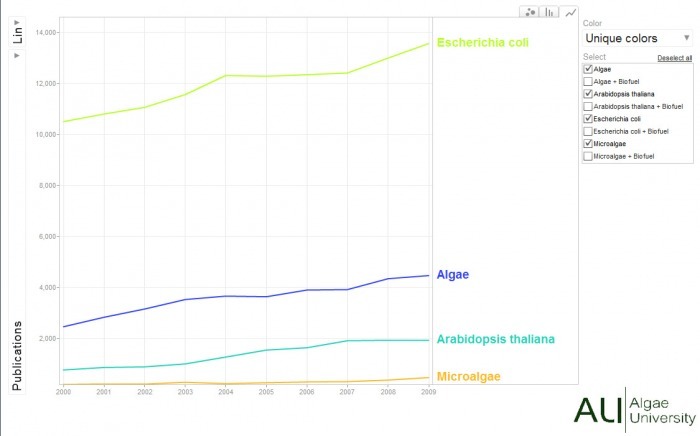 Play with this interactive graph on publications of model systems in relation to biofuels to see some interesting relationships. To view the publications over time be sure to change the horizontal axis label from "publications" to "time." 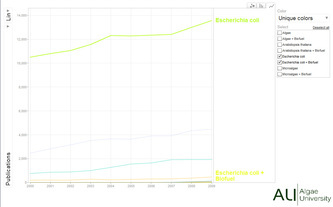 Below are some screen-shots of the outputs from the graph that you can generate.